If you haven’t seen Skye-born mountain biking legend Danny MacAskill performing miracles in his film Riding the Ridge then do so but, as they say on TV, don’t try this at home! It’s impractical for us to provide enough bikes to suit all our guests but if you bring your own there’s inside storage available in the byre. You can hire bikes in Broadford. 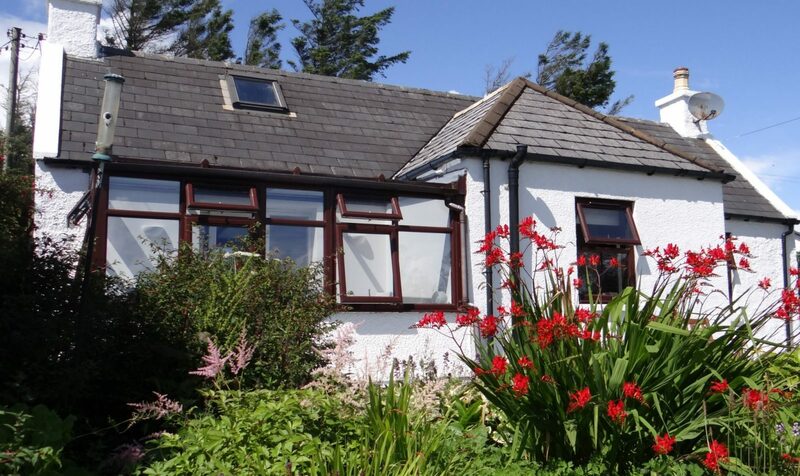 Springbank Cottage is ideally located for keen bikers to get onto the famous “Sligachan loop”, described by some as one of the “most spectacular mountain bike treks in the UK”. The loop comprises a 44 mile circuit that takes in glens running through both the Red Cuillins and Black Cuillins as well as the pass of Am Mam and the beautiful bay of Camasunary. You can start at Springbank in Elgol and head towards Strathaird on the B8083 and take the Camasunary track (GR 545172 – turn left) over Am Mam and down onto the shore at Camasunary. From the bothy follow the track through Glen Sligachan which will lead you to Sligachan Hotel. To complete the loop take the A87 (turn right) as far as Luib and pick up the track through Strath Mor (GR 533284 – turn right as far as the B8083 (turn right) which takes you all the way back to Elgol passing the Camasunary track on the way. Slightly less daunting is a loop of just over 5 miles takes in Glasnakille and Drinan townships before returning to Elgol. From Springbank turn right and follow the road down the infamous Doddie’s Brae keep left round past Elgol Hall and head over the moor to Glasnakille. Turn left after the cattle grid and continue to the road end. Once through the gate follow the track until it meets the end of the Drinan township road. Follow this road until it meets the Elgol road where you turn left and follow the road back to Springbank. Hardy bikers do it the other way round so as to go up Doddie’s Brae! There’s plenty to do during a trip to Skye and Springbank Cottage is a great base. If you want more than just a “standard” holiday cottage, then take a closer look. We hope you will be surprised by how much is on offer during a stay at Springbank Cottage.